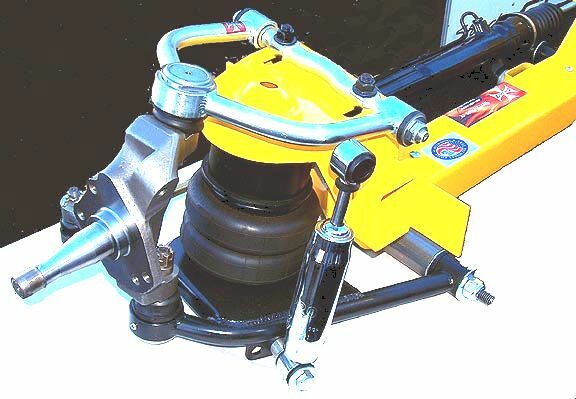 We Offer Complete Hub-To-Hub Mustang II IFS Front Suspensions for most popular street rod applications!! Packed With No-Extra Charge Options!! 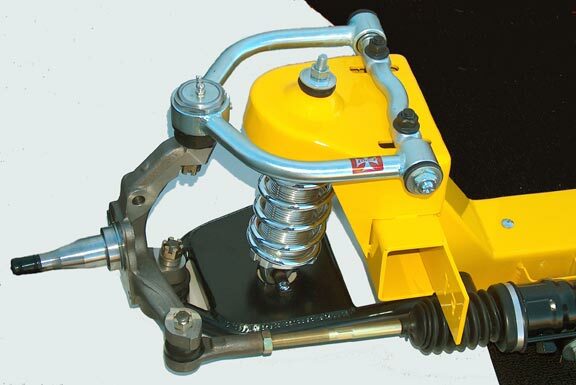 NO EXTRA CHARGE for your choice of manual or REBUILT power rack and pinion. NEW tie-rod ends. 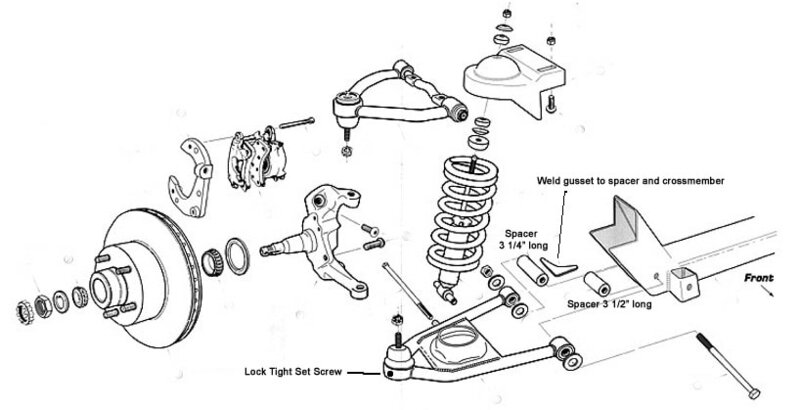 NEW rack-and-pinion bushings, NEW T-bolts. NOTE: if rebuilt power rack is unavailable, NEW power rack adds $185 to kit price. 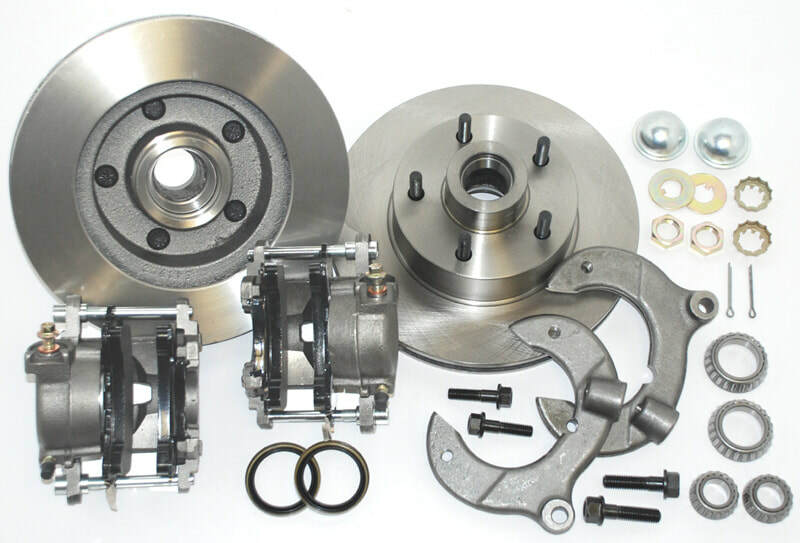 NO EXTRA CHARGE for your choice of NEW 9-inch or 11-inch Big Brake Kit (Used to be a $250 option!) Click pic for larger view. 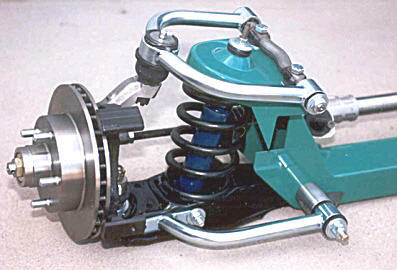 NO EXTRA CHARGE for your choice of NEW stock Mustang II spindles or 2" drop spindles. 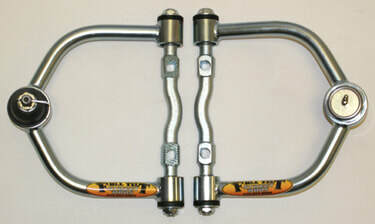 NO EXTRA CHARGE for Full Tilt's Tubular Upper Control Arms. Click pic for larger view. 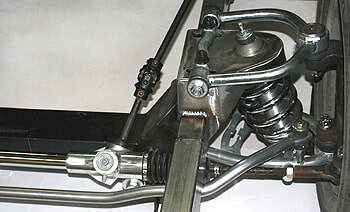 NO EXTRA CHARGE for your choice of: 1) stock spring-style Mustang II lower control arms with Full Tilt Strut Rod Eliminators; 2) Full Tilt Coil Spring-style Tubular Lower Control Arms; 3) Coilover-style Tubular Lower Control Arms (must be used with coilovers or Shockwaves only); or 4) Air Bag-style Tubular Lower Control Arms. Click pic for larger view. 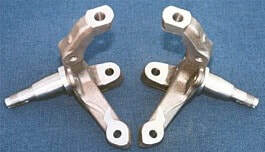 NO EXTRA CHARGE for our NEW Ford-into-Ford Lower Control Arms (below). Click HERE for details. Okay, besides the screaming-deal price, WHY BUY FULL TILT'S HUB-TO-HUB KIT? Compare these features with any other hub-to-hub kit available! 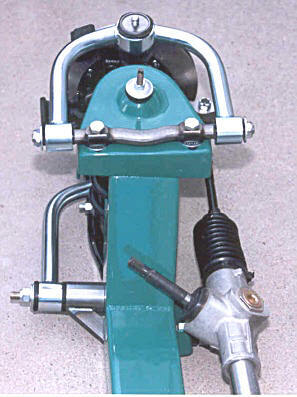 * Kit includes Full Tilt's Mustang II Crossmember and spring hats -- see application list at right. *All crossmembers are precision cut from 3/16" steel. 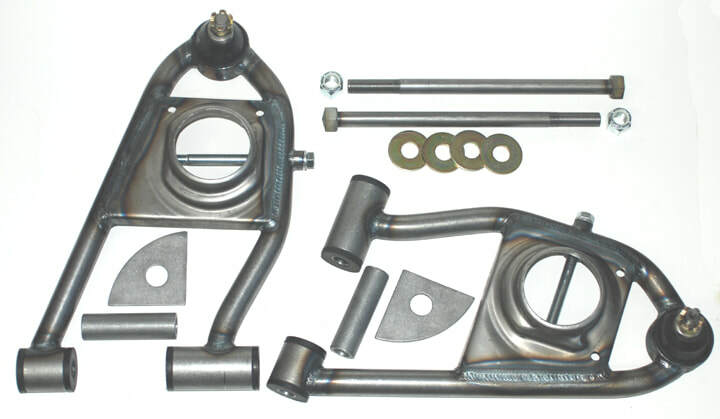 ​*All kits includes our U-Build-It Crossmember that comes pre-assembled and tack-welded - all you have to do is finish-weld and grind! 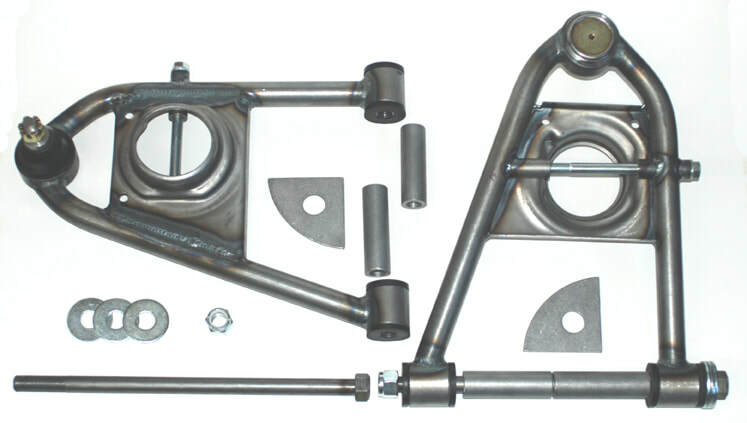 Or for an extra hundred bucks, we'll fully weld and finish the crossmember for you. 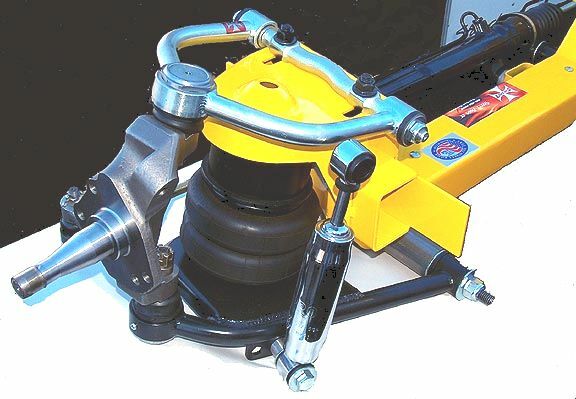 Air Bag Kit - 2 double-convoluted air bags, 2 upper spacers, w shocks and hardware - add $476. Chrome shock kit (shown) add $125. 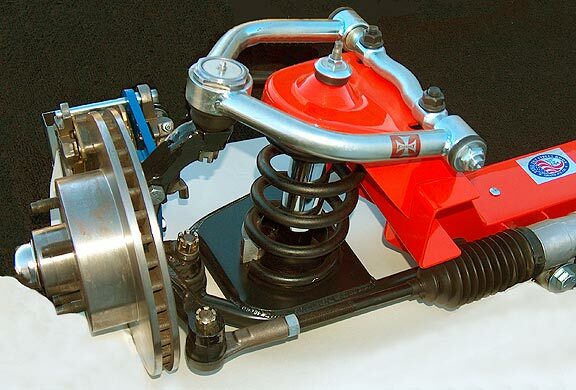 Coilover Kit - 2 polished aluminum double-adjustable front coilover shocks and new bullet-proof bright silver powder coated springs - includes thrust bearings and wrench kit - add $475. don't forget related items you'll need for your project!